The Flybe Community Hero is a new initiative that the airline announced at the start of its new partnership with Eastern Airways on 1st September. And it is pleased to now invite islanders to nominate the exceptional and inspirational individual in Stornoway and the wider local communities that they feel is deserving of extra special recognition. Flybe will honour them with, amongst other surprises, having an aircraft named after them. One person chosen from those who send in a nomination for the eventual winner will stand to win a pair of return tickets on one of Flybe’s direct routes operated by Eastern Airways from Stornoway. Nominations for the Stornoway Flybe Community Hero can be made online at https://www.flybe.com/heroes/ from yesterday (Wed 13th September 2017) through to midnight on Wed 4th October 2017. The winner will be announced during the week commencing 9th October, 2017. There are many unsung heroes who, through their time and dedicated service, make outstanding contributions to their community or to the wellbeing of their neighbours. Flybe CEO, Christine Ourmieres-Widener, said on announcing the initiative at the beginning of the month: “Flybe specialises in connecting and engaging with the communities we serve. “We all know at least one person who goes that extra mile or gives their precious time to help their community or each other - it could be a neighbour, a charity hero, an outstanding volunteer – the list is endless. 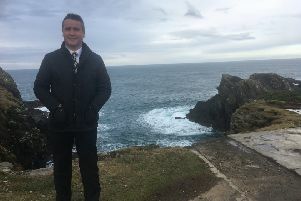 “Their selfless energy and commitment often goes unsung which is why Flybe is so looking forward to recognising Stornoway’s own wonderfully inspiring person.